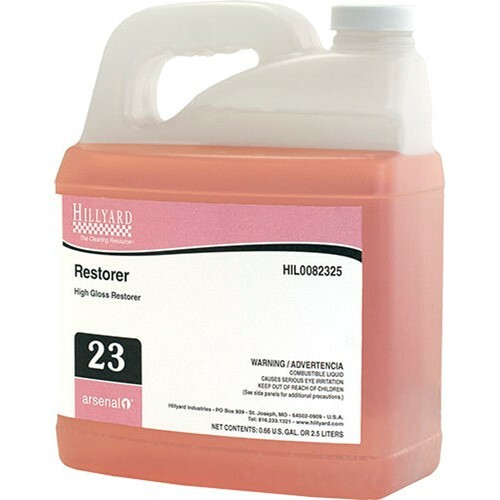 Home → Chemicals → Hillyard, Arsenal One, Restorer #23, Dilution Control, HIL0082325, Four 2.5 liter bottles per case, sold as One 2.5 liter bottle. A quality gloss restorer formulated to deliver a deep gloss and extend the life of your floor finish. It protects your base coat and keeps traffic lanes, heel marks, and scuffing to a minimum while restoring gloss to maximum levels. Restorer resists powdering caused by the heat and friction generated with ultra high-speed burnishers, plus its durable formula helps extend the time between refinishing to save time and money. Dilution rate 4 oz per gallon. Easy to use with any system. Extends the life of your floor finish.